Hello lovelies! I've had a crazy busy start to the New Year - one of my best friends from college came to visit, the next week my family came to visit, and I've started my second semester of grad school. That being said, I'm a tad behind on my 2018 intentions... but I'm not giving up. Reorganization and reenergizing are on the agenda for this weekend. But, let's get back to the blog! I've missed writing and I have some fun posts lined up for the next few weeks (an editing guide will be one of them so stay tuned!). In the past year or so, I've become more and more obsessed with home decor and one of my favorite recent projects has been styling my bar cart! I love bar carts because there are so many different ways you can go when thinking about a theme. For mine, I went with beachy/boho and I couldn't be more in love with it! Whichever way you decide to stock/style your cart there are some essentials you need to make sure it turns out amazing - read on. The first essential is obviously the cart. 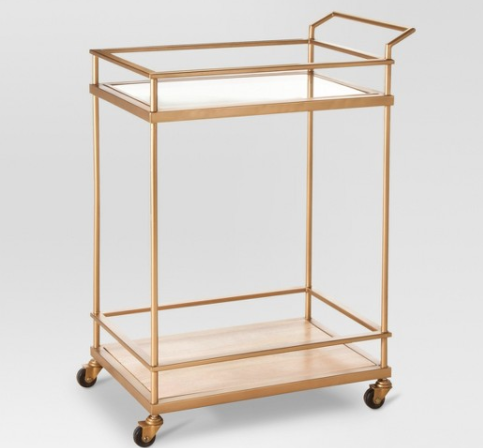 My favorite bar cart look is a combination of gold, glass or wood, but there's so many other options as well! Some great places to shop for your cart are Target, World Market, Anthropologie, or Wayfair. My cart: from Target and it was less than $150, which is such a steal! It's still in stock so act fast. Find it here. Glassware: Next, pick out a collection of glasses to create the vibe you're going for. Want elegant? Opt for some champagne flutes and wine glasses. Want beachy/boho? Find some glasses that have fun patterns or details (like the cactus glasses linked in the photos below). The glassware you decide to feature on your cart sets up your "look" so choose wisely! On my cart: margarita glasses, mini mason jar shot glasses, patterned wine glasses, moscow mule glasses. From World Market, TJMaxx, and Target! Liquor: I like to keep at least one or two bottles of alcohol on the bar cart. This gives the cart some shape and height which is pleasing to the eye and it's what it's made for.. duh. 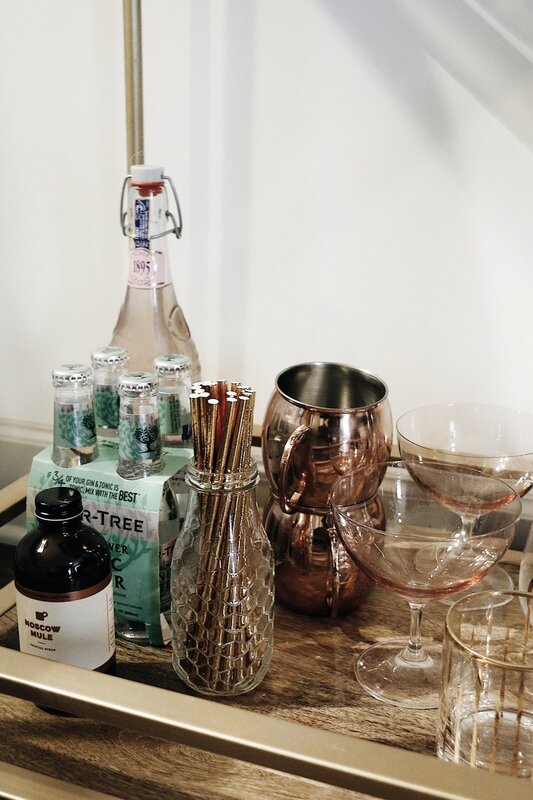 If you don't actually stock the bar cart with alcohol you're kinda missing the point! My favorite bottles to stock: red wine, rosé, Austin Cocktails, tequila, or rum! I also like to keep different mixers on the bottom shelf of the cart that are aesthetic and actually serve a purpose for creating amazing cocktails. On my cart: Elderflower tonic water, rose lemonade, moscow mule mix. From World Market and Target! 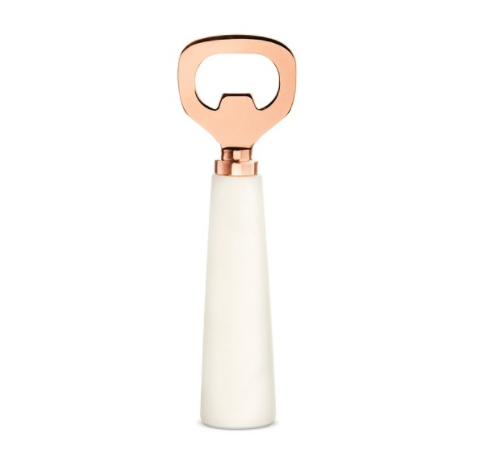 Bar accessories: It's crucial to have a collection of bar accessories so that you can actually put together those yummy cocktail recipes you've been eyeing forever! Do they actually make a difference? YES! On my cart: cocktail shaker, cocktail strainer, muddler, corkscrew and a bar spoon! From World Market and Target. Bar cart decor: My favorite part of bar cart styling - the decor! This is when you can bring your vision of your bar cart to fruition. There are so many things you can decide to add to your cart to dress it up, snazz it up, and make it pretty AF. You can go so many directions for this step but you MUST have one or more cocktail books! 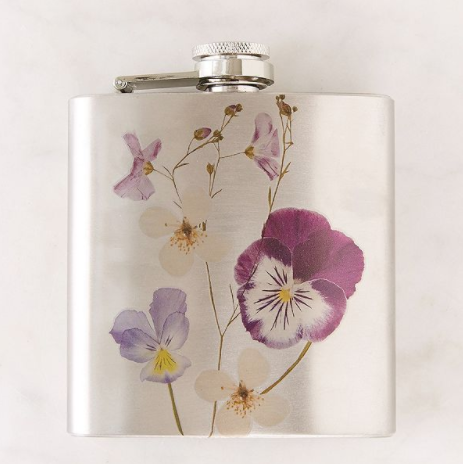 Personally, I think a cocktail book pulls the whole look together. 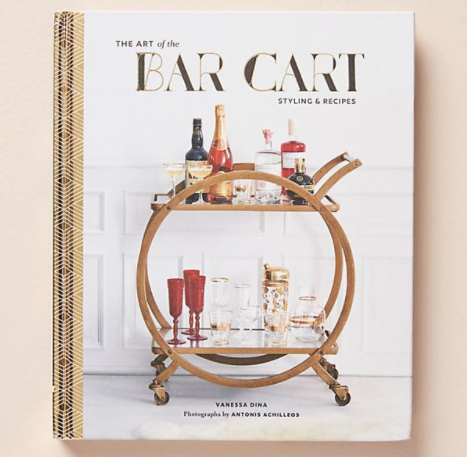 On my cart: cocktail books, gold paper straws, marble serving tray, coasters, and candles. From Marshalls, Target and Homegoods! Sign up with your email address to receive post alerts and updates!